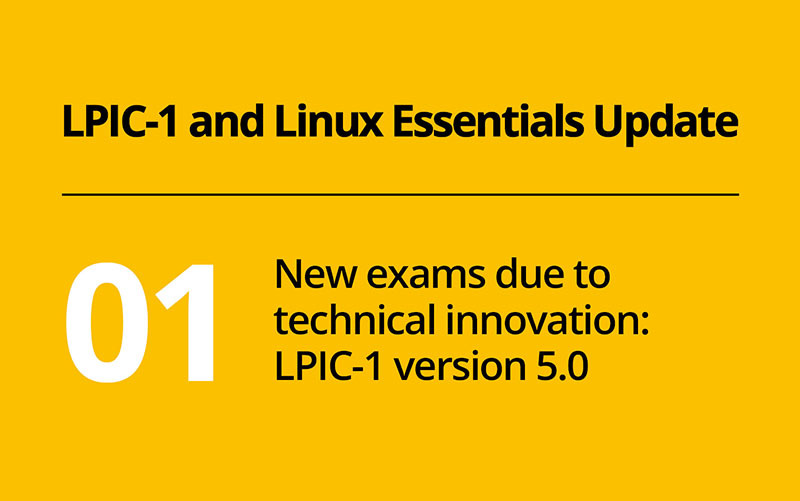 Since October 2018, the latest versions of the LPIC-1 exams are available. Many people see the exams 101 and 102, which are required to obtain the ‘LPIC-1: Linux Administrator’ certification, as an ideal starting point to launch a career in open source. Higher-level certifications, such as LPIC-2 and LPIC-3, are useful to reach senior levels in IT administration and to increase potential earnings. Certification holders show employers that they have dealt with Linux professionally and have a profound knowledge of the matter. Therefore, it is essential that we frequently adapt the exams to changing demands of the job market. To identify these demands, experts discuss topics that could be relevant for a new exam version every three years. During this process, deprecated topics are removed from the exams. The basis for this discussion is the exam development mailing list, used by experts throughout the world to exchange ideas and discuss the requirements of their respective markets. One of the new topics in LPIC-1 is, for instance, systemd and related services. systemd was already a topic of version 4.0 of LPIC-1, but version 5.0 introduced a few more aspects, such as systemd mount units, timers and the command timedatectl. As UEFI and GUID partition tables are used more frequently, they were included in the new exams. Topics dealing with networks, graphical user interfaces and desktops were completely revised. Meanwhile, topics such as SQL and disk quotas were removed. These are just some noticeable examples; many other changes were made, too. To ensure that candidates preparing to take an exam are not surprised by topics they weren’t expecting, the LPI offers a 6-months transition period during which either the new or the old versions of the exams can be taken. As an LPI book author, I base the update of my books on the wiki of the Linux Professional Institute. I also recommend this website to my students, because it is easier to search through it using Strg+F than to thumb through a book. You find information on the latest exam topics as well as a compilation of the topics which were changed in the new exam version. I often notice a certain fear of new exams among my students. I can assure you that these fears are completely unfounded for any candidate working closely with the LPI objectives. To ensure acquired certifications are always up-to-date, the status of a certification is set to ‘inactive’ after five years. It is, however, possible to get a higher level certification before the end of the period and thus keep the status of the certification active. If you plan to take a new LPIC-1 exam in the next couple of months, I recommend you read this blog regularly, since we plan to publish further posts about the changes in the new version. Harald Maaßen has been a member of LPI e. V. since 2014 and supports LPI as an exam proctor. He works as a trainer, book author and network administrator. You can reach him via e-mail (harald at nwa-net.de). Rheinwerk Publishing offers information and extracts from his books on the current LPIC-1 and LPIC-2 exams.